Microwaving kitchen sponges and plastic scrubbers — known to be common carriers of the bacteria and viruses that cause food-borne illnesses — sterilizes them rapidly and effectively, according to University of Florida (UF) engineering researchers. Note: To guard against the risk of fire, people who wish to sterilize their sponges at home must ensure the sponge is completely wet. Two minutes of microwaving is sufficient for most sterilization. 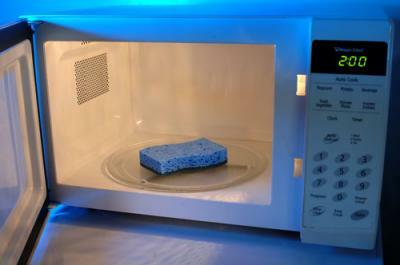 Sponges should also have no metallic content and people should be careful when removing the sponge from the microwave as it will be hot. Bitton, an expert on wastewater microbiology, co-authored a paper about the research that appears in the December issue of the Journal of Environmental Health. Food-borne illnesses afflict at least 6 million Americans annually, causing at least 9,000 deaths and $4 billion to $6 billion in medical costs and other expenses. Home kitchens are a common source of contamination, as pathogens from uncooked eggs, meat and vegetables find their way onto countertops, utensils and cleaning tools. Previous studies have shown that sponges and dishcloths are common carriers of the pathogens, in part because they often remain damp, which helps the bugs survive, according to the UF paper. Bitton said the UF researchers soaked sponges and scrubbing pads in raw wastewater containing a witch’s brew of faecal bacteria, viruses, protozoan parasites and bacterial spores, including Bacillus cereus spores. Like many other bacterial spores, Bacillus cereus spores are quite resistant to radiation, heat and toxic chemicals, and they are notoriously difficult to kill. The UF researchers used the spores as surrogates for cysts and oocysts of disease-causing parasitic protozoa such as Giardia, the infectious stage of the protozoa. The researchers used bacterial viruses as a substitute for disease-causing food-borne viruses, such as noroviruses and hepatitis A virus. The researchers used an off-the-shelf microwave oven to zap the sponges and scrub pads for varying lengths of time, wringing them out and determining the microbial load of the water for each test. They compared their findings with water from control sponges and pads not placed in the microwave. The results were unambiguous: Two minutes of microwaving on full power mode killed or inactivated more than 99% of all the living pathogens in the sponges and pads, although the Bacillus cereus spores required four minutes for total inactivation. Bitton said the heat, rather than the microwave radiation, likely is what proves fatal to the pathogens. Because the microwave works by exciting water molecules, it is better to microwave wet rather than dry sponges or scrub pads, he said. “The microwave is a very powerful and an inexpensive tool for sterilization,” Bitton said, adding that people should microwave their sponges according to how often they cook, with every other day being a good rule of thumb. Spurred by the trend toward home health care, the researchers also examined the effects of microwaving contaminated syringes. Bitton said the goal in this research was to come up with a way to sterilize syringes and other equipment that, at home, often gets tossed in the household trash, winding up in standard rather than hazardous waste landfills. The researchers also found that microwaves were effective in decontaminating syringes, but that it generally took far longer, up to 12 minutes for Bacillus cereus spores. The researchers also discovered they could shorten the time required for sterilization by placing the syringes in heat-trapping ceramic bowls. Bitton said preliminary research also shows that microwaves might be effective against bioterrorism pathogens such as anthrax, used in the deadly, still-unsolved 2001 postal attacks. Using a dose of Bacillus cereus dried on an envelope as a substitute for mail contaminated by anthrax spores, Bitton said he found he could kill 98% of the spores in 10 minutes by microwaving the paper — suggesting, he said, one possible course of action for people who fear mail might be contaminated. However, more research is needed to confirm that this approach works against actual anthrax spores, he said.